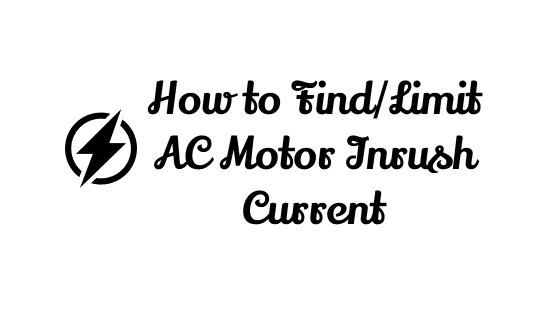 Inrush current problems while start up of the solid state equipment's as copier, computer and magnetic devices like motor, drives a large amount of current flows and this value of current is several times of steady state value and known as Inrush current. There is no actual known formula for calculation of this Inrush Current value but yes we can determine an approximate value. When a Motor is started or Transformer energizing takes place then the inrush current can cause a imbalance in the power circuit. However, this inrush current is for few seconds but we should take appropriate actions for this problem. We will discuss the few major actions which can be adopted to limit the Inrush Current value. 1) Try to keep the Large Ratings Motor on a separate power supply, it will prevent the voltage sag problem. 2) Use Inrush Current Limiting Thermistor, its resistance decreases the temperature increases. 3) Use Series capacitors for distribution circuit of large Rating Motors. The value of the Inrush Current at start Up can be found out using the Clamp Meter and noting down the measured Value and after that try to use the one of the above method to limit the value. After implementing the method just measure the Value of Inrush Current again and check whether it is reduced or not. Subscribe to Automation-Talk by Email for more articles.